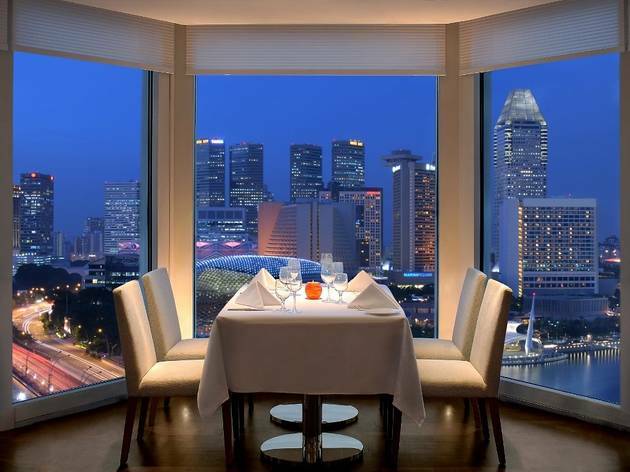 The spectacular views of Marina Bay from the lofty heights of the Fullerton Hotel are only an added bonus to the excellent menu that chef Diego Martinelli has put together. 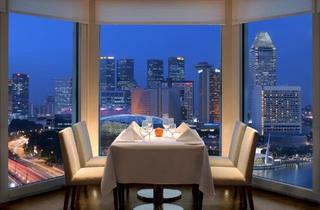 The dishes provide rich flavours with a light, modern touch. The standout starters include steamed mussels in a tomato, chilli and caper sauce; spice-dusted goose liver with a fennel salad; and sea scallops with a crust of black olive and sun-dried tomatoes is an absolute delight. Tortellini stuffed with duck and mascarpone, and topped with a rosemary sauce, is a highlight among the main courses, as was the Wagyu beef tenderloin with creamed celeriac and porcini jus. The grand finale arrived in the form of a melting-heart chocolate and coconut fondant, as well as strawberries sautéed in balsamic vinegar.